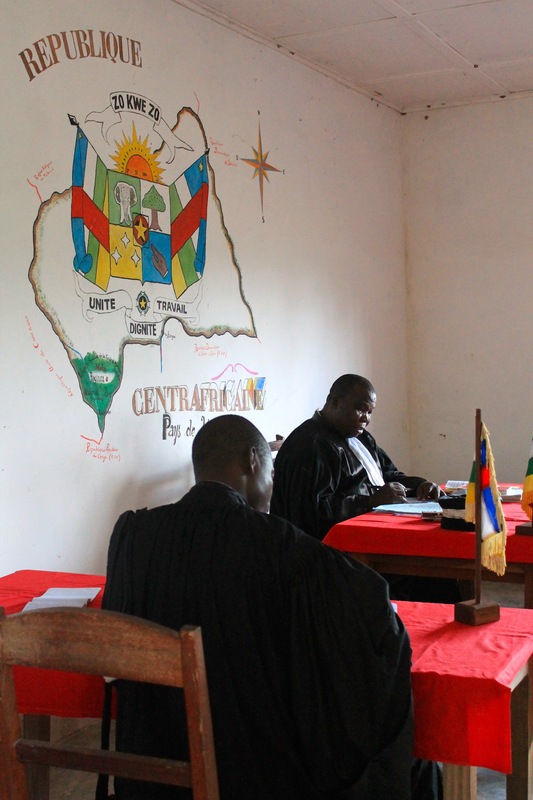 This is Stéphane’s third and final blog post from the Central African Republic (CAR) after recently leaving his position as WWF Technical Advisor in Sangha Sangha park. Check out part 1 and part 2. One of the last places on Earth where prehistoric forests exist is now a front-line of the illegal wildlife trade. My advisory duties were varied, from negotiating with logging concessions, talking to ministries and international partners to mentoring park rangers. It held its fair share of torturous but necessary administration, but included field responsibilities – especially going on anti-poaching patrols. I should have been an observer, noting, advising and looking for opportunities for improvement; anyone working in the field, though, will concede that being on the ground makes you de-facto part of the team. Someone they can depend on and you on them. Yet, being a Westerner on an armed patrol in the CAR could be misinterpreted. The savannah north of the national park is a hot-bed for criminal activities. Operating there is informally denied and formally discouraged, yet rebels control the diamond mines just around the corner and run trafficking networks into Cameroon and Congo. It is where our war collides with theirs, where the savannah fades and the African jungle begins and ends in Zambia. Imagine: we plan to patrol from the centre/north sector of the Sangha Sangha national park, zigzagging our way past the buffer-zone to the fringe to intercept poachers, avoiding mixing with more rebel-like folk. We start hacking, meandering through the thick jungle, slithering through the vines and riverbeds until we reached our staging area. The second in command is in a bad way due to sickness, so he is cut from the patrol. Two men are down out of the original seven, making it three rangers, a tracker and me, lighter than expected. Most poaching gangs operate in groups of at least five men, reaching ten to fifteen. We perform a perimeter check. The launching point is a camp-site used by rangers and poachers alternatively. We begin our mission planning with the team leader. There is a clearing a few kilometers from the camp-site, a choking-point for wildlife. 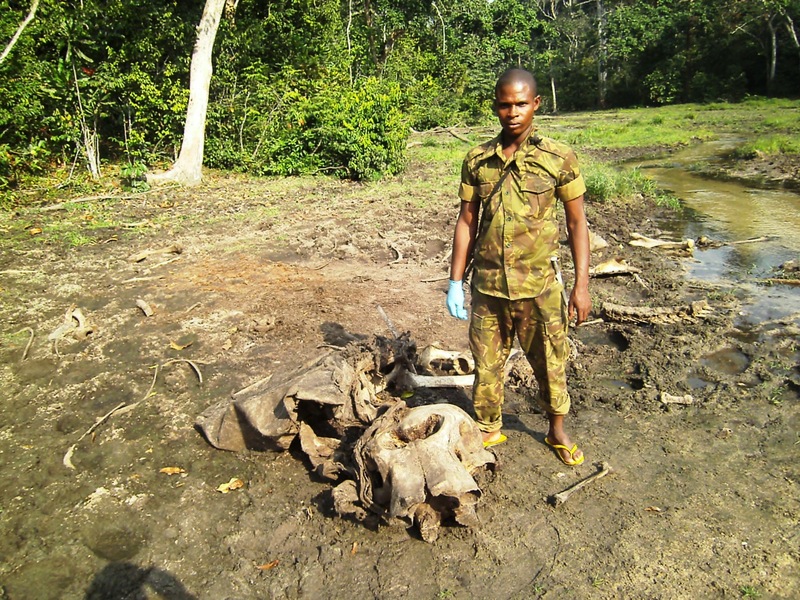 There I confirm the presence of an old elephant carcass, his skull and remains thrown into a muddy ditch to hide the despicable act: this is confirmed in the after-action reports, but the once majestic, decomposing animal’s remains, though, are somehow more compelling. The air is damp, the sky red and we use flash-lights through the mud, out of the clearing, into the jungle avoiding falling debris. It hasn’t rained in three months: patrol day one turns out to be day one of the rainy season. Rain is like the hour-glass of anti-poaching, setting the rhythm of the game of cat and mouse. Heavy weather sends deadly projectiles and masks the charging elephants; poachers stand idle, rangers poise in wait, all in ambush of their different prey. Like poachers, we patrol with the intent of resupply, in this case water: minus some treated water, I eat and live as rangers do. Jerrycans formerly containing fuel taint the coffee in the most particular of ways, while the food has a muddy tinge: we eat caterpillars, seeds, powdered manioc, sardines and rice. The next day’s patrol reveals cold poaching trails but healthy wildlife. Our campsite was trampled with leopard tracks. One doesn’t think of nature as enemy number one on patrol: then suddenly thousands of bees, out of a Hitchcock movie, send five armed men into their nets waiting for nightfall. Later two or three leopards visit us, inquisitive and calling to each other, they approach a few metres from my hammock just to tease. The next day, caught off-guard by torrential rains, the patrol resumes in miserable conditions. We avoid charging elephants by a few meager meters and a shy King Cobra shedding on a trail. 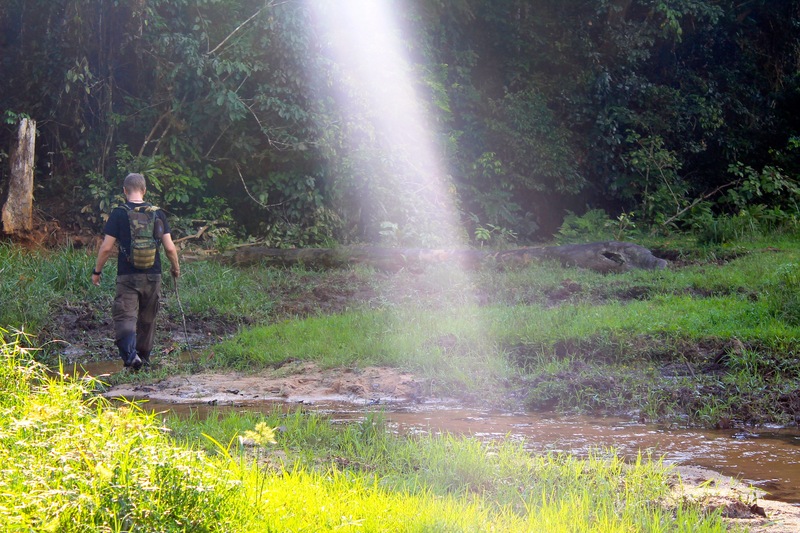 We hadn’t met any poachers; still this patrol can prove unforgiving. The days mix and merge, damp, dirty, tired, hungry, thirsty, and bruised. From one camp to another, investigating trails, hearing gunshots, searching old poaching camps, crossing rivers to clear our tracks, making our way to our flanking position. We intended on intercepting infiltrating poachers, unsuspicious for the lack of car tracks, moving on foot over four days instead of driving four hours. It is like a big hike in the forest but in a war-torn country, looking for criminals in a game of cat and mouse, in a magnificent environment. Finding a moment to enjoy the raw beauty of this place is what makes it worthwhile, what reminds us why we do it. On the last night we heard several gunshots, medium-calibre ammunition, a couple of kilometers away. We sat by the fire, listening, debating the echo, the ‘pop’, the direction indicating movement. We set out early to investigate, but our conclusions rule out their presence in the immediate vicinity; however, while waiting for a ‘pickup’ that morning one ranger notices a leaf bent in the wrong direction. The trail reveals characteristic markings, imperceptible to the untrained eye, yet the patterns emerge. Changing our formation, we followed the lead until three leaf beds and warm ambers confirmed it. The trail was hot, the team shifted again, I took ‘six-o’clock security’ and we progressed. Our point-man suddenly stops, holds his hand up, crouches, lays flat. A tense moment later, the hunt is on. We take on two shooters in chase and seize one with the weapon. The other gets away. A quick talk revealed there was a camp with six poachers up ahead; he would lead us to it. Dragging the prisoner along, the hunt resumes in tension. The other poacher could be laying in wait, or he could warn the others we were coming. We were committed. Down a river-bed, up a small cliff, the camp lies fifty meters ahead. I hold back, securing the prisoner while the team raids the camp; alone, with one man in custody, his teammates could be laying in ambush, leaving me exposed. I hear clatter, yelling, but no gunshots. A minute later, our tracker gives me the go-ahead. I pull the prisoner from the ground and proceed to the camp. They all fled, the water still boiling, their ammunition boxes, machetes and animal entrails strewn across the ground. We missed the target but our mission was a success. An entire hunting party with ammo but no weapon is useless. We disrupted their operation and put a dent in the instigators’ finances: still, we felt that we had come up short. We brought the prisoner back to camp for interrogation; he would become an informant or go to jail. Allegedly he wasn’t who we were looking for, a pawn. He was paid in bullets to hunt, feeding the vicious circle. Though, on the next hunt he could be given a high-calibre weapon and shoot elephants. We gave him food and water and he would be taken away, along with me, while the rest of the team would proceed to another point. It took the ‘pick-up’ team six hours, seven men and chain-saws to clear the road. This sector increases our reach in isolated northern areas, opening the road makes way for the building of an advanced camp, a launching point for future missions: the spot was ideal. The price of ivory steadily rose over my year and half in DSPA, reaching over $180 a kilogram on the border: there exist different qualities on the market determined by density, pink hue, matching pairs. An opportunistic poacher will be easily recruited with a weapon, ammunition and 150,000 XAF or GBP 160 as pocket/bribery money, plus a percentage on every kilo he harvests. The individuals who provide us with this information are deeply involved in the poaching and have links to high-level ringleaders abroad. They come to me for a job, as a porter or tracker; I recruit them for targeted missions and counter-intelligence but betrayal is common-place and conservation does not pay well. Not long after our patrol, another group ambushed a Cameroonian hunting ivory that almost shot them – here ‘frontline’ is not a euphemism in the illegal wildlife trade. Stéphane Crayne, MA specialized in Conflict and Conservation, is a former French army officer now committed to preserving the world’s most endangered animals, now the centre point of armed conflict and trafficking. Having grown up in Africa, his work for WWF in the Central African Republic promotes a “counter-poaching” concept fostering a multidisciplinary approach to conservation in conflict zones.